In the future I will look back on February 4, 2015 as one of the highlight days of my life. Yesterday, in the presence of family, friends and colleagues I was installed as the president of my professional association. 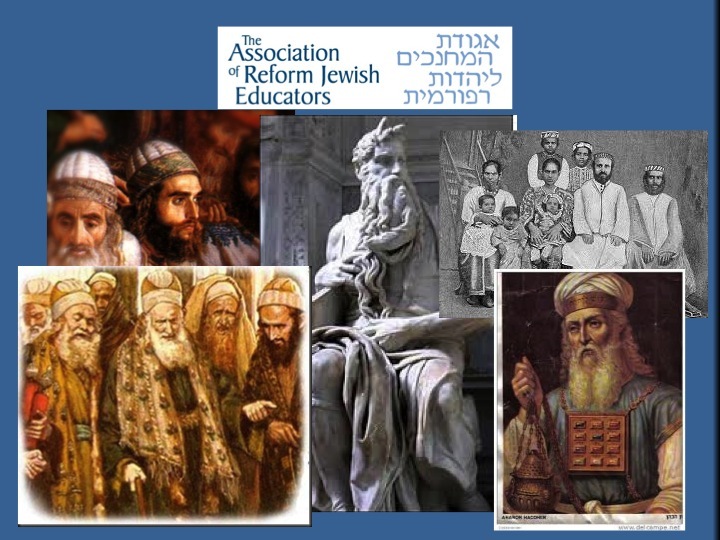 Depending on how you count it, as of July 1 I will either be the 33rd president of the organization formerly known as the National Association of Temple Educators, or I will be the 1st president of the Association of Reform Jewish Educators. My installation followed a historic plenary meeting of the membership in which we approved a name change of our 60 year old organization. I am honored to take on this mantle of leadership and humbly share my installation remarks here for those who were not present to hear them. I am so blessed that several members of my family are here, not only tonight, but all week. I wish my sons could have been here for me to embarrass. Max just began a semester in Israel on NFTY EIE, and Saul is newly employed in his first post-college job in the tech industry. We are hoping that he will someday earn enough money to support his Jewish professional parents in their old age. Of course, my beloved husband Rabbi Rick Winer is here with me, always faithfully by my side. You may have seen my father, Mark Novak and mother Marsha Novak – a Jewish educator in her own right after a 40 year career in early childhood education – in some of our sessions over the past couple days. And while my brother Richard couldn’t be here, and sadly my twin sister Deborah fell ill, I am very happy that my other twin, my cousin Sara Getzkin is here. You may recognize Sara as one of the professional organizers from TLC’s Hoarders Buried Alive. Admit it, some of you do watch it! And thank you, the members of our ARJE family, for being here and helping make this gathering an indispensable source of learning, support, collegiality, and friendship. Like many of you, I live in a remote Jewish community. We like to say that Fresno is 3 hours from everywhere. Despite the distances, most of the time I don’t feel so isolated because I begin almost every day of the week with some sort of meeting, conference call, or email exchange with Jewish education colleagues from around the continent. Living in a relatively remote community, far away from a community of Jewish educators, the work I do on behalf of our organization and with many of you fills me. I am personally enriched by these connections and relationships. Professionally, my interactions with Jewish education colleagues keep me abreast of challenges, successes, trends and innovations that are taking place in other communities and inform my work as a Jewish education consultant and doctoral student. The best remedy for feeling lonely or isolated as a Jewish educator is to get involved in the Association of Reform Jewish Educators! Before sharing with you my vision for ARJE, I’d like us to take a couple of moments to study a piece of Jewish text. While I wish we could take time to go in-depth together, this setting isn’t the most conducive for that. So, I’ll introduce it and then ask you to turn to your neighbor for a very brief hevruta conversation. Our Rabbis taught: How was the Mishnah (the Oral Torah) taught? Moses learned it from the mouth of God, then Aaron entered and Moses taught him his portion. Aaron moved and sat to the left of Moses. Aaron’s son’s entered and Moses taught them their portion. His sons moved aside, Eleazar sat to Moses’ right, Itamar to Aaron’s left… Then the elders entered and Moses taught them their portion. The elders then moved aside, and the rest of the people entered and Moses taught them their portion. In this way, Aaron heard each portion four times, his sons three times, the elders twice and all the people once. Then Moses left, and Aaron taught his portion [to those assembled]. Then Aaron left, and his sons taught their portion. Then his sons left, and the elders taught their portion. Thus everyone had heard the portion four times. Take a few moments – 90 seconds – with a person near you to discuss: what does this text teach us about the educational process? At this point in my remarks I paused so that people could discuss the question with a neighbor. I then invited a couple of people to share their responses with the group. As I said, I wish we could spend more time with this. For now, let me share with you some of what I take from this passage. The primary lessons I take are three: shared teaching & learning, shared leadership and shalshelet hakabbalah, the passing on of a chain of tradition. One could say that every person in our text, including Moses, is both a learner and a teacher in the process of transmitting the Oral Torah. Each person, or group of people, is able to engage in learning, not just once, but four times. And, each person, or group of people, is given the opportunity to be the teacher as well. I would suggest, that even am yisrael (the people of Israel) have the opportunity to teach as they take the lessons they’ve learned v’shinantam l’vanecha – teach them to their children. The same can be said for us as members of this Association of Reform Jewish Educators. We all have the opportunity to serve as learners and teachers in the work of Jewish education. Over the course of these last four days we have learned from and with each other. Over the course of these last four days we have taught each other as well – about our visions for Jewish education, about the challenges and successes we face in our institutions. We each have Torah to teach. And we do that when we come together for our gatherings and professional learning opportunities, either virtual or in person, when we interact through our Facebook group or twitter or contribute to conversations in the URJ Tent on the Yammer network. The second lesson our text illustrates is a model of shared leadership. We learn once again that Moses is not the sole leader of the people. He has a cabinet of co-leaders in Aaron, Eleazar, Itamar and the elders. They share the responsibility for teaching Torah to the people. Each does his part in his own way. This model of shared leadership is one that we conscientiously embrace as an organization. Our work grows out of a foundation that values collaboration and consensus. We work together in teams. No one stands alone. So, while I stand here tonight, being installed as your next president, I know that I do not stand-alone. There are at least 50 other volunteer leaders in our organization who stand alongside me, as together we give our time and passion and energy to ensuring that our professional association serves your needs as Jewish educators in our Movement. Third, our text is comparable to the opening passages of Pirke Avot, in which we learn that the written Torah is passed down from Moses, to Joshua, to the prophets. Similarly, in this text it is implied that the oral Torah is passed on. Yet, one unique difference is that in this text, the oral Torah is shared in the current community as well as passed on from one generation to the next. Each teacher stands side by side, contributing his own Torah to the conversation. And, each teacher stands on the shoulders on the ones who precede him. The shalshelet hakabbalah extends across not only time but also space. As we begin this 60th year, we too are recipients of our shalshelet hakabbalah, our own chain of tradition. We too stand on the shoulders of those who came before us. Our founders created a home address for Reform Jewish educators. Their vision has carried us to this day. With the ratification of our new name, we now carry that vision forward, reframing it for today in order to meet the needs of our diverse membership. Both our new name and mission reflect who we are as an association. We are Jewish educators who are proud of our profession, our expertise and the Torah we have to share. We are an association that is excited and optimistic about the Jewish future and the future of Jewish education. We are an association that takes care of its members when we enter into placement or are renegotiating a contract, or approaching retirement. We celebrate milestones. We are an address for high-level professional learning and networking with fellow educators. People are impressed when they hear that we are members of the Association of Reform Jewish Educators because our reputation is one of unqualified professionalism and excellence. However, our new name and mission call us to face some real challenges as an organization. As we know from our Salary and Benefits Survey, our members are not solely temple educators. Sitting in this room tonight we have: youth professionals, camp directors, supplementary school directors from a variety of settings, early childhood educators, consultants and coaches, day school professionals, and leaders in central agencies. For many of our 60 years we defaulted to thinking that our members work in congregations. That remains evident in the language we use and the way we talk about our work. So, while it will take time and work and patience, we have to change our mindset. Additionally, it is incumbent upon us to revisit who are members are and who our members could be. I believe this to be one of our highest priorities. I am very pleased that we have already begun this work with a task force that is helping us take a first step, by identifying necessary new membership categories and proposing a dues structure that aligns with our new mission. Additionally, we have begun conversations with RYPA, the Reform Youth Professionals Association, to explore potentially merging our two organizations. Our name and mission intensify who and what we have always been – a professional association. We must continue to support our members to the high level we have become accustomed to – to advance our profession, to advocate for the Jewish educator in the settings in which we find ourselves, to promote our growth as professionals. We are the same professional organization even better! Our name and mission propel us to take a brave and bold stand as the voice for Reform Jewish Education. The Jewish landscape has changed significantly in the last five years. Organizations have merged or contracted or closed their doors. Who is going to take a stand on Jewish education in our Movement if we don’t? So what does this mean for us? Our Defining Our Voice task force is helping us answer this question. We have a voice that is heard only when we speak up. That voice emanates from each of us as we demonstrate our dedication to excellence and our steadfast leadership. That voice emanates for each us when we raise up, celebrate and convene conversations about Jewish education. That voice emanates from us when we increase our profile and presence in conversations in the Movement and the Jewish education community. As individual Jewish educators we should each align ourselves with ARJE in our bios, blog posts and online conversations. As an organization, we will continue to represent the Jewish educator in communal gatherings and conversations. And we must be prepared to invite and welcome other voices to our own table as we take our rightful place as thought leaders in the Reform Movement and in the field of Jewish education. We have reached a watershed moment as an organization. It is incumbent upon us to live up to our new name and to realize our mission in concrete and meaningful ways. It will require a great deal of work on everyone’s part, tenacity in the face of challenges, and dedication to the tasks that lay ahead. May we each be like Rabbi Preida, committed to our work as educators, never giving up on those we teach. And may our Association of Reform Jewish Educators be like Rabbi Preida, meriting the benefits of our devotion to Torah and Jewish learning.